Dell’Erica is one of the specialists, that we recommend for families with children: it has three clubs for children, cared by an attentive and selected multilingual staff. All beach lovers will have a bright selection of small bays to discover, as in fact, there are 16 beautiful coves around the Resort. 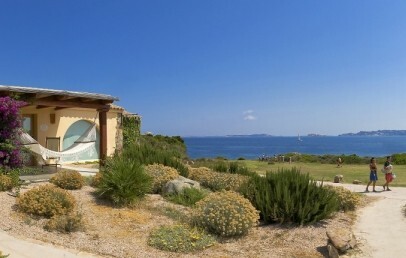 The Resort Valle Dell’Erica is located on the north of Palau, on the edge of the National Marine Park of La Maddalena – just in front of the wonderful uninhabited island of Spargi. It is situated 4 km from the little village of Porto Pozzo with its harbour and shops and 12 km far from Santa Teresa di Gallura, famously positioned by the straits of Bonifacio. The original construction at the Resort Valle Dell’Erica dates back to 1958 and was the very first holiday village in Sardinia to be built – at that time there were no restrictions hence its vicinity to the sea – its owner was a pioneer of the Sardinian tourist industry that was to follow. At Only 80 m from the hotel, (80–200 m from the rooms) you will find the gorgeous bays of Valle dell’Erica, some with free sun-beds and umbrellas reserved for the hotel guests. Confining with the Resort, one big wonderful beach reachable by foot. The resort offers two hotels, Hotel Erica and Hotel La Licciola, and has a unique and unbeatable position, just a few metres from the stupendous white sandy bays with time-sculptured rocks and immersed in one of the most beautiful natural areas on the whole island. Thanks to the different areas, the numerous little bays reachable by foot, the romantic rooms with panoramic view, the warm and welcoming atmosphere of the Thalasso & SPA Centre along with all the services on offer, this is a truly wonderful oasis of peace, perfect for couples. The Resort offers refined rooms, 4 swimming pools, 7 restaurants, 5 bars including a swim-up bar. The Hotel La Licciola offers moreover an “Exclusive” area, more private area with its own fresh water pool and only for guests over 6 years. The 4 swimming pools are located overlooking the Archipelago: 3 with sea water, one for adults and one for children in Hotel Erica, one with three large pools connected by waterfalls between the natural rocks in Hotel La Licciola and another of fresh water pool in the “Exclusive” area with panoramic sea view. A total of 148 rooms, including Junior Suites and Suites, just 80 to 200 m from the sea. All rooms are furnished by refined interior decorators in typical Mediterranean style and enriched of local handcraft items and have covered verandas furnished with 2 deckchairs (or table and 2 chairs), bathroom with shower, hairdryer, air conditioning, Sky TV, safe, minibar, beach towels and bathrobes for adults. Sea view is available with supplement and cots have to be requested by booking. The Wi-Fi connection is available in the verandas of the rooms. Double single use – bedroom with double bed, bathroom with shower. Classic – bedroom with double (twin beds only upon request) bathroom with shower. Superior Erica – bedroom with double bed (twin beds only upon request), bathroom with shower, possibility to add a cot. Family Suite Erica Sea View – are two Superior Erica Sea View rooms interconnecting from the inside; each room has a double bed and its own bathroom. Possibility to add cots. Junior Suite Erica – bedroom with double bed, open lounge area with an inbuilt sofa bed; bathroom with shower. Possibility to add a cot. Junior Suite Mirtilla – bedroom with double (twin beds only upon request), lounge area with a sofa bed for 2 or an inbuilt sofa bed, bathroom with shower. Family Suite Mirtilla Sea View – a Junior Suite Mirtilla Sea View interconnecting from the inside with a double Classic Sea View. 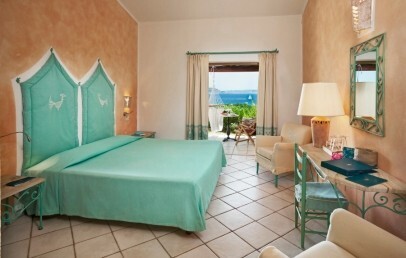 Suite Erica Sea View – room with double bed, living room with sliding door and a sofa bed for 2 or an inbuilt sofa bed. 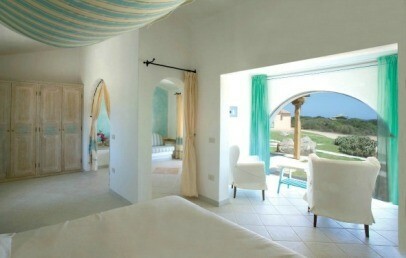 Giglio / Orchidea – 6 double rooms (only for guests over 14 years) suitable for couples looking for something really special. The rooms are spacious and have a beautiful bathrooms; some of them have a tub and a shower; and wide terraces. These rooms are located inside the Thalasso Centre and Spa and have a free direct access to it (treatments with extracharge). President Suite Spargi Sea View with Privat Pool – prestigious bedroom (63 sq.m.) with superb view and a spacious panoramic terrace; 2 bathrooms and a whirlpool. Wide room with double bed, living room with table and 2 inbuilt sofa beds (suitable for teens under 14 years old). Possibility to add a cot. Rooms Hotel LA LicciolaThe Hotel La Licciola offers a variety of rooms, suitable for couples and families with children. The Wi-Fi connection is available in the verandas/balconies of the rooms. Superior Licciola – the room possesses a double bed (single beds on request) as well as a cot. Sea view with supplement. Family Suite Licciola – two communicating Superior rooms. Each room has a double bed (single beds on request) with the possibility of a cot in one room and in the other a sofa bed. Each room has a bathroom. Sea view rooms with supplement. Junior Suite Licciola – the room possesses a double bed or single beds on request, a living room area with an inbuilt sofa bed or a single sofa bed and the possibility to have a cot. Sea view rooms with supplement. Suite Arcipelago Sea View and Pool – the Suite has a double bed (single beds are on request) and a living room with sliding door. Here are 2 inbuilt double sofa beds + possibility to have a cot. Two luxury bathrooms and a large equipped and covered veranda. Garden with a private swimmingpool and a wooden solarium with a view over the Bocche di Bonifacio. President Razzoli Sea View – the exclusive Suite with a private pool in the garden with solarium and a view of the islands. It possesses double or single beds (on request) and a separate living room with two single sofa beds, a wide veranda with a breath-taking panorama and the possibility to have a cot. 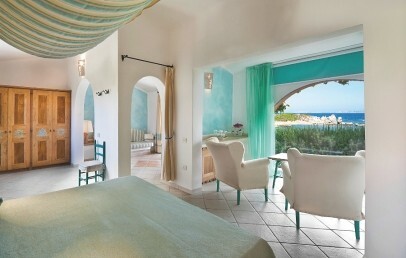 Imperial Suite Sea View – the wide and luxurious rooms offer 154 sq.m., a private garden and a swimming pool. It consists of two connecting floors with also independent entrances. The first floor consists of a bedroom (double bed or single beds) and a living room separated by a sliding door with a panoramic view; here are two single sofa beds + a cot. On the ground floor is the second bedroom – with a double bed – and a living room separated by a sliding door. Here is an inbuilt double sofa bed and a sofa bed + the possibility to have a cot. A bathroom in each floor and a wide equipped terrace / patio. The Area "Exclusive" is available only for guests of following room typologies and for children with minimum 6 years. Superior Exclusive Sea View – double bed or two single beds on request. Junior Suite Exclusive Sea View – double bed or single beds on request, living room with an sofa bed. Junior Suite Family Exclusive Sea View – loft Suite with double bed (single beds on request) and an open space living area with two single beds on the lower loft-floor. Rooms are available from 15:30; the check-out is unti 11:00 of the departure day. There are several bays surrounding the Resort Valle dell'Erica. At about 200 meters away there is a large public beach with an equipped area, reserved for guests of the resort, with beach bar and free use of umbrellas, sun beds, showers, bathrooms and changing rooms. The modern and enchanting beauty centre has been developed in a perfect natural setting of granite rocks and covers an area of approx. 1600 sq.m. The centre consists of: 4 outdoor multi-function pools filled with sea water and heated to different temperatures for the Thalassotherapy circuit. 15 elegant private cabins for thalassotherapy treatments, massages and beauty treatments; Turkish bath, sauna, relaxation area, cardio fitness rooms and reception. Access to the wellness centre: € 40,00 per person (half day): free use of the pools, Turkish bath, sauna, gym and relax area. Free entrance for adults staying in Giglio and Orchidea Benessere with free use (reservation required) of the thalasso pools, Turkish bath, sauna, fitness cardio room and relax area. PS: A self-certification of "good health" needs to be signed on-site before attending any kind of treatments and to use the facilities. Special treatments are available for pregnant ladies. Upon booking you may request to our booking assistants further informations about the available packages at “Le Thermae”, it will be our pleasure to advice and book for you the best treatment that will complete your wellness holiday package. Practice Green 3 holes 3 par inside the Resort, with natural and local grass (with extracharge); joining lessons and hiring clubs to be arranged locally. Free lessons for children under 13 years old. With extra charge: qualified school for diving, sailing courses in the nearby villages (transfers from the hotel to be paid extra) and excursions by sea or by land. Trekking itineraries for adults and children (both inland within the scent of myrtle and junipers and the pink granite, and external paths along the coast to discover the wonderful small bays merged within the green and the blue of the sea). Equipped gym free of charge and cardio-fitness area, with extracharge, is located inside the Wellness Centre. Baby kitchen free of charge is equipped with all electrical facilities for cooking and rehating meals; baby food is available as also changing table, babyphone, baby chairs and pushchairs (nursery is open 24h). Baby Club participation needs an extracharge and is available for infants from 2 to 4 years; parents must show a medical certificate issued not later than 3 days before the arrival where the pediatrician confirms that the kid has not any transmissible illness. Mini Club is free of charge from 4 to 9 years. Children can have lunch and dinner with the animation staff in the reserved kids area (with supplement for kids in only half board for lunch). During the day, children have at their complete disposal a swimming pool with water games - separated from the main one - suitable for children of all ages, an outdoor and indoor playground, fields and courts, golf and swimming courses; activities, entertainments after dinner. The mentioned services are available 7 days a week from 9 am to 11 pm. For teenager from 10 to 13 years old club focuses on games and sports: snorkelling, canoeing, mini soccer, green volley, golf and Adventure Day: a unforgettable journey with the canoe to discover the little bays around the resort and a lot more… Nintendo Wii, play station, X box free of charge. The Delphina Hotel Group is well known for its high quality restaurants and the Resort Valle Dell’Erica exceeds all limits with its excellent cuisine, varied every evening for your pleasure. There are 7 restaurants and some bars where guests will enjoy their favourite meal. Elegant buffet and show cooking are available at Nautilus (where there is also a room for smokers) and/or Les Bouches; or, with reservation but without supplement, an attentive table service with candle light dinner is served at Il Grecale and/or Les Bouches. La Prua offers dinners by candlelight with a romantic atmosphere and at Li Zini exclusive dinners are organised directly on the beach with fresh-fished sea food and sea specialties (both are upon reservetion and with extra charge). Li Ciusoni serves local dishes made according the typical Gallura cuisine with local genuine products (with extracharge and reservation required). Pizzeria / Restaurant / Grill reserved to kids and located where the miniclub is. The bars Nemo, Conchiglia and Caracoli offer tasty snacks and light lunches around the pool and by the sea. The Mediterranean Brunch® is offered for lunch from 12.30-14.30, for € 32 per person per lunch (children from 0-1 years free of charge, children from 2-14 years € 16 per lunch). The brunch has pizzas, tasty meals as pasta, salads, cheese... (meat, fish and dessert are not served). Guests discovering the Gallura and wish to take advantage of the Brunch Around during their excursions in one of the 4/5 star hotels of the Delphina Group, need prior to book it at the reception. Upon request, at the moment of the reservation, personalized gluten-free menus. On request and with additional cost: Thalasso & SPA Centre and “Thalasso by Night” (with possibility of exclusive use of the Wellness Centre). Rentals, excursions and all extras. Included in the price: typical gallurese cuisine lessons (but in August), assistance at the doctor's office (certificates and medical visits outside timetable with supplement); wifi in the resort and in the terraces/patio of the rooms; internet point in reception; outdoor private parking. The Resort offers a variety of entertainment facilities: three sea water swimming pools, entertainment and live music in the evenings, as well as many facilities for children, such as the Baby Club and the Mini Club. Further, the guests have the possibility to play various sports, be in within the resort or in the immediate vicinity. 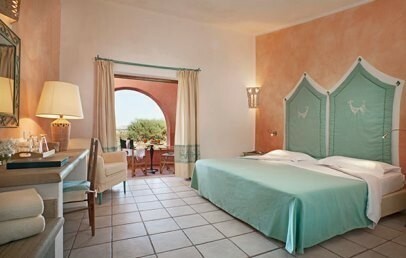 Double room furnished by refined interior decorators in typical Mediterranean style and enriched of local handcraft items. The private bathroom is equipped with shower, hair dryer, beach towels and bathrobes for adults. All Classic rooms have a garden view veranda with chairs and table and with independent entrance. 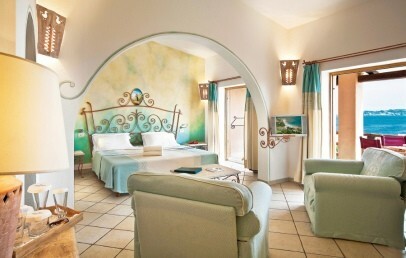 Double room furnished by refined interior decorators in typical Mediterranean style and enriched of local handcraft items. The private bathroom is equipped with shower, hair dryer, beach towels and bathrobes for adults. All Classic rooms have a sea view veranda with chairs and table and with independent entrance. Double room plus a cot if requested. It is furnished by refined interior decorators in typical Mediterranean style and enriched of local handcraft items. The private bathroom is equipped with shower, hair dryer, beach towels and bathrobes for adults. All Superior rooms have a garden view veranda with chairs and table and with independent entrance. Double room plus a cot if requested. It is furnished by refined interior decorators in typical Mediterranean style and enriched of local handcraft items. The private bathroom is equipped with shower, hair dryer, beach towels and bathrobes for adults. All Superior Erica sea view rooms have a sea view veranda with chairs and table and with independent entrance. Spacious Junior Suite furnished by refined interior decorators in typical Mediterranean style and enriched of local handcraft items. It has a small lounge area with a wall sofa bed for a child until 12 years not completed. On request is possible to add a baby cot for free of charge (0-2 years not completed). The private bathroom is equipped with shower, hairdryer, beach towels and bathrobes for adults. All Erica Junior Suites have a garden view veranda with chairs and table and with independent entrance. Spacious Junior Suite furnished by refined interior decorators in typical Mediterranean style and enriched of local handcraft items. It has a small lounge area with a wall sofa bed for one child until 12 years not completed and on request it is possible to add a baby cot for free of charge (age 0-2 not completed). The private bathroom is equipped with shower, hairdryer, beach towels and bathrobes for adults. All Erica Junior Suites have a sea view veranda with chairs and table and with independent entrance. Spacious Junior Suite furnished by refined interior decorators in typical Mediterranean style and enriched of local handcraft items. It has a lounge area with a sofa bed for 2 or an inbuilt sofa bed. The private bathroom is equipped with shower, hairdryer, beach towels and bathrobes for adults. All Mirtilla Junior Suites have a garden view veranda with chairs and table and with independent entrance. Spacious Junior Suite furnished by refined interior decorators in typical Mediterranean style and enriched of local handcraft items. It has a lounge area with 2 sofa beds for children until 12 years not completed. Upon request and availability it is possible to receive a Junior Suite Mirtilla sea view intercommunicating with a double room Standard sea view with the access from one room to the other through the veranda. The private bathroom is equipped with shower, hair dryer, beach towels and bathrobes for adults. All Mirtilla Junior Suites have a sea view veranda with chairs and table and with independent entrance.